Elizabeth City, NC (January 11, 2019) – Gail Coleman, President of Howard Hanna Real Estate Services’ Southeast Region, today announced that James Vernon, II has been named Manager and Director of Sales of the Howard Hanna Currituck, NC office, in addition to the Elizabeth City, NC office, that he will continue to manage. Vernon began his real estate career with Howard Hanna’s Currituck office. He subsequently relocated to Raleigh where he continued his real estate career with another prominent real estate firm, Allen Tate Realty. Having grown up in Elizabeth City, he returned in 2018 and was named Manager of the Howard Hanna Elizabeth City office last February. Prior to entering the real estate business, Jim was a very successful defense contractor working as a general manager for his firm, driving sales, and overseeing marketing strategies and budgets. Vernon has always been dedicated to creating an environment that fosters individual growth in addition to teamwork. Coleman also announced that Chris Noble has been named Assistant Manager of the Elizabeth City office. A sales associate in the office since 2011, Noble is originally from Edenton and now resides in the Riverside area of Elizabeth City. He is a licensed general contractor and provided design, sales, and marketing skills at his family’s business, Noble Brothers Cabinets & Millwork. For all of your real estate needs, contact Jim Vernon at 252-338-7653 or JVernon@howardhanna.com or Chris Noble at 252-337-4457 or ChrisNoble@howardhanna.com. 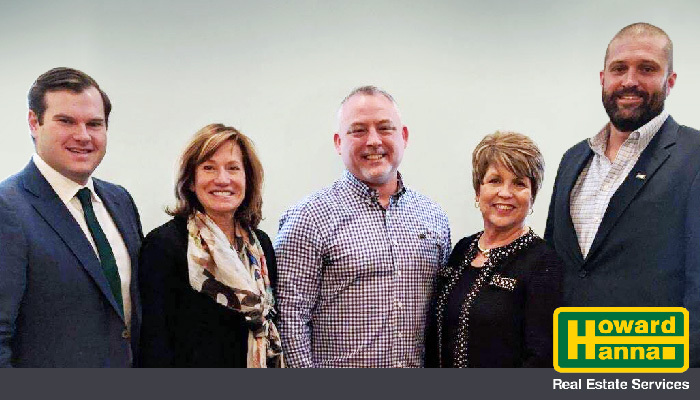 Pictured L to R: Dennis Cestra, Jr., Vice President -Howard Hanna Southeast; Robin McCabe, Venture President -Towne Mortgage; Jim Vernon; Gail Coleman; Chris Noble.